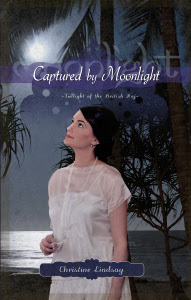 Today I am pleased to recommend an amazing book, Captured by Moonlight by Christine Lindsay. If you haven’t read book one of the Twilight of the British Raj series, Shadowed in Silk, you need to check out this award-winning novel as well. Since I know many of you have already experienced this breathtaking adventure, let me just say, I think Captured by Moonlight (unbelievably enough) might be even better. First let me mention the facets of both books in this series that I love. The settings and history are amazing!!! I love these peeks at Gandhi’s India rich with spices and colorful silks. They are full of adventure and a realistic depiction of the difficult lives the characters faced. The spiritual elements are beautifully and organically woven into the stories, and truly inspire me. Christine is a topnotch writer in every sense of the word. Now for a few of the things that I liked even better in book 2. Laine Harkness is a spunky heroine full of courage and conviction. I love that about her. She’s not afraid to take risks and fight for what is right. I also love the even richer setting of the jungle full of exotic plants, animals, and characters. Finally, my favorite character in book one is Eshana, and she moves into a more pivotal role in book two, launching on her own adventure and exploring her own first hints at romance. Eshana faces many trials in this book which push her to the very edge, yet her deep, personal, and even supernatural faith see her through. Did I help edit this book? Guilty as charged. But I was given a true gem to start with. The story completely engulfed and delighted me, even in the early draft. I have no doubt you will love it as well. Yep, absolutely. And under $4 for kindle, so why not? I enjoyed Shadowed in Silk so I can't wait to delve into this one. Thanks for the enthusiastic review, Dina! Can't wait. I know this is going to be great! Sounds like another fascinating story fron Christine. Yes, I agree that she's wonderful at writing all those rich details that really put you in the midst of her exotic locales. Kudos, Christine. And Dina, thanks for showing us which the book's all about.